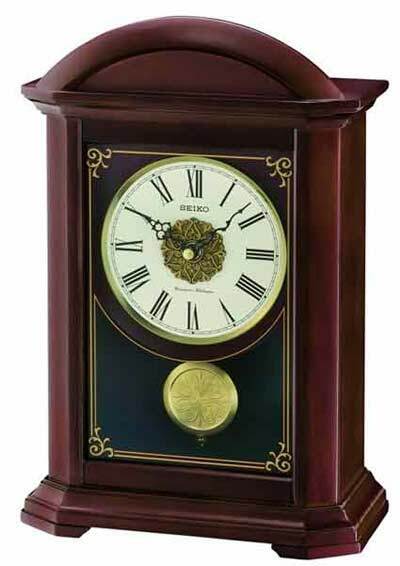 Seiko QXQ030BLH Garamond Chiming Mantel Clock offers a solid wood case in a dark cherry finish. Arched, solid wood top molding with a cast, decorative antique brass medallion as a center disk on the dial. Westminster chimes or Whittington chimes. Volume control; and an automatic Night - time silence selection. Operated by 1 "C" battery which will power the clock for well over a year at a time. Size: Height: 14", Width 10", Depth 4 3/4".